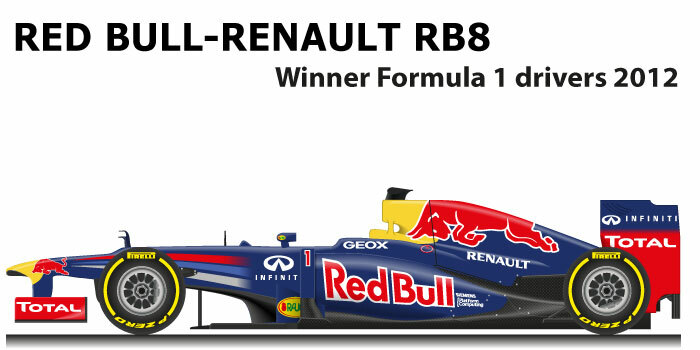 The Red Bull – Renault RB8 n.1 is the single-seater of the Formula 1 World Championship in 2012. After the season dominated in 2011 with Red Bull RB7, Adrian Newey tries to add something new to a very strong design base. The new regulation forces the stables to a front profile that is not aesthetically pleasing to Formula 1 fans. Sebastian Vettel wins with the Red Bull – Renault RB8 n.1 the Formula 1 World Championship in 2012. For the binomial Vettel-Red Bull is the third consecutive success. The season sees the builder of Milton Keynes in trouble against Fernando Alonso with the Ferrari F2012. Vettel after a disappointing first part of the season where he only gets the victory in Bahrain, in the second part he throws four consecutive wins in the Grand Prix of Singapore, Japan, Korea and India, overtaking the Spanish Ferrari driver forced to retire in Belgium and Japan because of the crashes of the Lotus pilots. At the last race in Brazil despite a spin at the beginning of the race the German driver arrives sixth and wins the title. Red Bull also wins the constructors’ title. GP winner: GP of Bahrain 2012, GP of Singapore 2012, GP of Japan 2012, GP of South Korea 2012, GP of India 2012.